The Whistler WS1098 Scanner offers amazing capability along with ease of use. The expected frequency coverage is: 25-54, 108-136.99, 137-174, 216-512, 764-781.99, 791-798.99, 806-960 (excluding cellular bands) and 1240-1300 MHz. 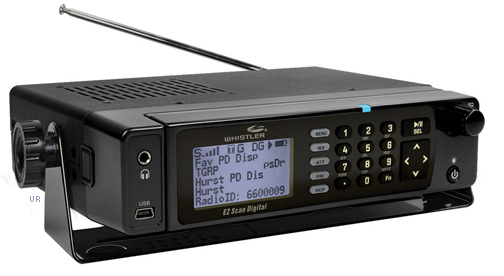 This radio comes with a 2GB SD card preloaded with US and Canadian public service frequencies. You may automatically program your scanner by merely entering your zip code or city. It handles analog and digital systems including APCO 25 Phase I & II. This model also features and illuminated keypad. Your WS1098 comes with vehicle mounting bracket, magnetic remote control head with 6 foot LAN-type cable, DC cable, AC adapter, SD Card with Software, telescopic BNC antenna, USB computer cable, Quick Start Guide and printed Owner's Manual. 1.255 x 1.75 x 5.35".